The Gold Key series of STAR TREK comics was concerned with the adventures of the crew of the Federation Starship Enterprise under the command of Captain James Kirk. Rather than featuring space battles or complex scientific phenomenon, the STAR TREK comics stories largely focused on Kirk and company journeying down to a strange and interesting planet and then interacting with the planet's inhabitants. In about half of the issues, the Federation men encountered aliens which looked exactly like caucasian humans. These humanoids were often fancifully dressed or attired in primative garb if they were an unsophisticated people. 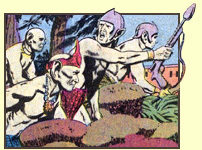 In four separate issues (#5, #8, #41 and 50) the alien people encountered looked exactly like bald caucasian humans. The comics series wasn't constrained by special make-up budgets like the television series. Thus the comics could easily depict all types of interesting alien life-forms, but for some reason in only about 30 instances did Kirk's crew encounter aliens that looked anything other than human. These three dozen or so alien races seen in the 61 issues of the Gold Key series of STAR TREK comics are shown and described below. Included for each is an image of one or more representatives of each sentient species, a brief description of their kind and the issue that they appeared in. Some of the aliens listed below were seen in the original STAR TREK television series. These are marked with an asterisk (*) and their descriptions include any differences between the comic and television versions. Technologically advanced, warp-capable humanoid civilization native to the planet Vulcan. U.S.S. Enterprise first officer Spock was half Vulcan. Vulcan society today is based on a philosophy of emotional control and adherence to logic, although Vulcans of 5000 years ago were a violent people driven by passion. Vulcans posses much greater physical strength compared to humans. Their hearts were located where a human's liver would be, and their blood was copper-based and green in color. Vulcans had telepathic abilities and their minds were among the most well ordered in the galaxy. In "The Brain Shockers" (Issue #11), we learned that thousands of years ago on the planet Vulcan the group of rational men who founded the new Vulcan philosophy based on logic and seeking perfection, developed a technique by which emotions were removed and sealed inside actual bottles. However, they discovered that removing one's emotions also dimmed that elusive spark called 'soul', and so they destroyed the device, and devoted themselves to teaching the value of logic instead. Those bottled emotions survived through the centuries, and were to have been placed in a shrine erected by the Vulcan people on the planet Beta IV. Technologically advanced civilization of humanoid warriors. The Klingon's technological level was roughly equal to that of the Federation. For several years, the Federation and the Klingon Empire have existed at the very brink of war. The Klingon people come from planets that were relatively poor in natural resources and thus they felt they had the right to take what they needed from other planets. They believed that only the strong should survive. The Klingons were the chief recurring nemesis in the STAR TREK television series, but they menaced the Enterprise crew in the comics on only a few occasions. The Klingons were dark skinned in the television series and had plenty of hair, but in the comic appearances they were frequently bald and had light skin. 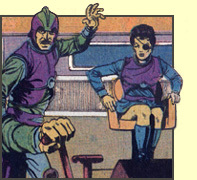 The Klingons uniform also was changed when seen in the Gold Key comics. Instead of being black with a gold diagonal sash, they became green and sleeveless with a red sash. Warrior civilization from the planets Romulus and Remus. An offshoot of the Vulcan people who left Vulcan 2000 years ago to found the Romulan Star Empire, the Romulans were a passionate, aggressive but highly honorable people. The Romulans were another recurring enemy of the Federation in the television series, and they too were seen in the comic incarnation, but very rarely. In one episode of the STAR TREK series, the Enterprise crew encountered a female Romulan starship commander. In the Issue #21 story "The Mummies of Heitus VII", another female Romulan commander was seen. The Romulans were merely incidental to that issue's story, however. 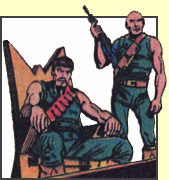 The comic series made rare use of the interesting Romulans, usually focusing instead on one-shot villian characters. The Romulan cloaking device was mentioned in Issue #12: "The Flight of the Buccaneer", but no Romulans were shown. Inhabitants of a planet within rocket range of the Nabu star system. The government on the home planet of these green-skinned humanoids had a unique system of punishment for their convicted criminals. Every month, the condemned were sent by one-way rocketship to land on a nearby system of asteroids to live until the unstable asteroids exploded. Targu was among those condemned to die on an asteroid time bomb. Race of technologically advanced bald humanoids with wide mouths from the M-class planet Alpha Z-21. These industrious people where led by Krill. In the mid 2260's, Krill's people wrestled with the problem of huge machines running amok on their world, constructing cities, roads and buildings without stopping. Technologically advanced race of underground city dwellers from the planet Inicrust. The Inicrust people were humanoids with light green scales covering their bodies. Around 2267, the crew of the Enterprise prevented the planet Inicrust from catastrophically colliding with the inhabited world of Morti. In 2367 the crew of the Enterprise encountered Malok on the planet Pollux II. Malok was a member of a race of diminutive, pink skinned humanoids with large craniums and green faceted eyes. Malok was immortal, but it is not clear whether all of his kind were similarly long lived. Technologically advanced, pleasure-loving humanoids from the planet Utopia, of which Nomad - the Dark Traveler was a member. Around 2267, Captain Kirk and his crew assisted Nomad to dethrone his brother Niklon who had taken over the planet with a race of robots and enslaved his fellow Utopians. Race of spacefaring blue-skinned humanoids with large faceted eyes of which J'Karl was a member. Many years ago, this race ventured to explore space and one of their astronauts, J'Karl, became lost in the netherspace called Limbo. Race of spacefaring purple-skinned humanoids with finned ears and a large ribbed cranial fin. Many years ago, this race traveled deep space and one of their space pilots became lost in the netherspace called Limbo, thereafter residing in the Museum building located there. Race of spacefaring humanoids with elongated heads and long pointed chins. Many years ago, this race sent out space explorers, and one of them became lost in the netherspace called Limbo. Race of technologically advanced pale-green-skinned humanoids with pointed ears which was a member of the United Federation of Planets. Doctor Lanugu, a scientist and leader of the Federation Science Council was a member of this civilization. Race of technologically advanced humanoids with large ribbed cranial fins. This race was a member of the United Federation of Planets, and one of their scientists sat on the prestigious Federation Science Council. Race of technologically advanced green-skinned, bald humanoids who were members of the United Federation of Planets. One of this species' scientists was a vocal member of the Federation Science Council in 2267. Technologically advanced civilization of large mouthed, smooth headed humanoids. Fado, the Vice Chairman of the Federation Supreme Council in 2267, was a member of this species. Race of technologically sophisticated humanoids with large orange eyes and prominant cranial fins. The power hungry Hajara, one of the Vice Chairmen of the Federation's Supreme Council in 2267, was a member of this species. Race of telepathic humanoids from the frigid Federation planet Floe Prime. The red Floens were lead by co-leaders Amara and Sunaro (pictured) and they dominated the blue-skinned members of their species. Through use of a special serum, the Floens adapted to their cold world and are able to sprout protective turtle-like shells when exposed to subzero temperatures. These shells then crack away when they re-enter a temperature that is right for their metabolism. Both races of Floeans became extinct in late 2267 when Floe Prime froze over after drifting too far from the planet's sun. Race of telepathic humanoids from the frigid Federation planet Floe Prime. Through use of a special serum, the Floens have adapted to their cold world and are able to sprout protective turtle-like shells when exposed to subzero temperatures. These shells then crack away when they re-enter a temperature that is right for their metabolism. The blue Floens were persecuted and enslaved by the dominant red Floens because of their different skin color and the blue Floens were denied the serum that allows their bodies to survive in freezing temperatures. Both races of Floeans became extinct in late 2267 when Floe Prime froze over after drifting too far from the planet's sun. Technologically sophisticated civilization of humanoids with thick, orange skin, and long prehensile tails. Honorary Starfleet Admiral Tailen Kahn was a member of this species. Race of pale yellow space faring intelligent humanoids with two small knobby projections on their forehead. They immigrated to the planet Hercula 10,000 years ago from their dying planet and upon arrival on Hercula, they conquered the native humans who lived there. The planet Alpha 23-C was home to a strange race of intelligent, roughly humanoid crystalline beings who in 2367 were ruled by Izor. The crystal people feed on light and have the mental ability to project paranoia beams at trespassers. Extinct race of single-eyed rocky humanoids from the planet Isis III. The Isisians went extinct 25 million years ago. Primative bronze-age humanoid civilization with special mental powers. Togotas were mutes who communicated by projecting mental pictures and they inhabited the Togo jungle regions on the planet Mobita. The innocent and trusting Togotas were discovered by the Mobians in the mid 2260's and they were soon exploited by the Mobians as laborers. Around 2267, Klingon agents fomented rebellion among the Togotas and supplied them with modern weapons with which to attack their Mobian oppressors. Race of spacefaring humanoids with forehead horns from the planet Kafri. In 2267, starfleet captain James Kirk went undercover and visited the planet Mobita disguised as a Kafrian in order to determine whether the rebellion of the Togotas was being incited by the Klingons. Race of sentient earless humanoids with deep-set eyes. A member of this species worked on Earth in 2267 as a journalist. Race of technologically advanced beings with designs on conquering Earth. Sometime between 2053 and 2267, these aliens tampered with the space-bourne cryostasis capsule containing terminally ill body of beloved Earth scientist and peace activist Dr. Bleikoff. These aliens implanted a device in the professor's brain capable of causing mass hypnosis so that when Bleikoff was eventually returned to Earth he would influence Earth's inhabitants to dismantle the planet's defense systems to enable an easy invasion. Technologically advanced humanoid civilization who originated on the planet Nraka. The Sanoorans undertook a great exodus from Nraka 500,000 years ago when they discovered that a rogue star would soon pass near the planet destroying all life. Huge colony starships were constructed and all of the inhabitants except for criminals, the incurably sick, and highly disturbed left the presumably doomed world. The Sanoorans chose an orbit that would return them to Nraka in half a million years after the radiation had subsided. Around 2267, the Sanoorans returned to their homeplanet and found the humanoid civilization which had arisen from the castoff population they left behind. The Sanoorans demanded that the planet be evacuated to allow them to recolonize, but the Nrakans successfully repelled the Sanooran fleet with the help of Captain James Kirk and the crew of the Starship Enterprise. The Sanoorans later settled on another planet. Race of intelligent diminutive, hairless, pale-yellow skinned humanoids. Once these people were technologically proficient, but they lost their problem solving abilities over the many years of relying on Wotam their ancient supercomputer to do their thinking for them. In 2267, their sun's supernova was imminent, and so with the help of Captain Kirk and Mister Spock, the People of Wotam constructed several large spaceships with which to leave their world and colonize another planet. Sentient beings of pure energy which usually adopted a roughly humanoid shape and which consumed most forms of matter for energy. These energy beings "hatch" from green pods which grow on an immense tree hundreds of miles high. The beings were created by the immortal human Zhyopha to become the dominant superior form of life in the galaxy. When Zhyopha's plans became known to the Enterprise crew in 2267, Captain Kirk convinced the old man that his "perfect creatures" were fatally flawed because they quickly run out of matter to consume for energy. Technologically sophisticated humanoid civilization that was a member of the United Federation of Planets. The Andorians had blue skin, white hair and two, long antennae on the back of their heads. They spoke with a soft lisp and were generally regarded as a violent people. Andorians were one of the five founding members of the United Federation of Planets. The Andorians had once been in conflict with the Vulcans starting in the 21st century, but became allies sometime prior to the founding of the Federation in 2161. Cloudlike sentient life-form that lived on a planetoid in the Gamma Canaris region. In 2117, the Companion discovered aged scientist Zefram Cochrane drifting in space, near death. The Companion brought Cochrane to her planetoid and cared for him, rejuvenating his body, giving him effective immortality, but subjecting him to extreme lonliness. Over time, the Companion grew to love Cochrane. In 2267, the Companion abducted Kirk, Spock, McCoy and Federation commissioner Nancy Hedford from the Enterprise shuttlecraft Galileo to live with Cochrane to alleviate his isolation. Hedford, terminally ill with Sakuro's disease, agreed to merge with the Companion, becoming a single, human individual. The resulting individual, still in live with Cochrane, remained on the plenetoid for the rest of a normal human lifetime. Technologically sophisticated race of diminutive, large headed humanoids with pale yellow skin. The Stoyaks were one of two sentient species that evolved on Bira III, sharing their world with the telekinetic savage Garda people who looked just like humans. The two races have been in a state of conflict ever since Stoyak technology developed sufficiently enough to allow them to fly over the radioactive barrier which divided their side of the planet from the Garda's. Race of space-faring technologically advanced bio-energy beings who could change shape at will. Like the Founders from the Gamma Quadrant, this culture would launch small ships into deep space containing infant members of its species. The being that would be known as the Great Vrunon on the planet Jodarr, landed on that planet several years earlier as a prenatal spore enclosed in such a space pod. Vrunon usually took the form of a lizard-like humanoid with a green scale-covered body. Race of intelligent, industrial-age humanoids with childlike bodies, large eyes and purple skin. The Eulusians were a quiet people and they inhabited a Class-M planetoid near the border of Federation space and the Klingon Empire. The Axanar were a race of technologically advanced bipedal lizard-like people. The Axanar breathe a nitrogen-methane atmosphere, are androgynous and live over 400 years. First contact with the Axanar was made in 2151 by Captain Jonathan Archer's U.S.S. Enterprise (NX-01), when the starship rendered assistance to an Axanar ship whose crew was murdered for the compounds found in their blood. One hundred years later, Axanar was the site of a vitally important battle led by Starfleet Captain Garth in the 2250s. While a cadet, James T. Kirk was sent to Axanar on a Peace Mission.